Craig Hignett is “excited” rather than worried about Hartlepool United’s tough trip to Oxford United. Following a 2-1 home defeat to second-placed Accrington Stanley on Tuesday night, the last thing most managers would want is a match at another promotion favourite. But Hignett is relishing the prospect of taking on the U’s at the Kassam Stadium. “I’m looking forward to Saturday and excited to be playing Oxford,” he told SportMail. “We’re away from home, it’s a game no-one will expect us to do anything. “But we can go there and cause an upset, I know we can. Hignett saw some positives from the performance against Stanley, even if the first 45 minutes left him frustrated. 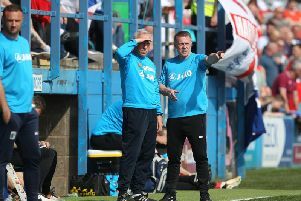 While Stanley looked a threat on the break, Pools forced John Coleman’s team on the backfoot, though there was to be no rewards for Pools, who lost after four straight home wins. “I did see some things I liked,” he explained. “I’ve learned loads about the team, the squad and the players. “In the second half we had a better shape and made it more difficult for them and they couldn’t get out at times. “Unfortunately, I can’t remember their keeper making too many saves. “We will always create chances, but I felt as it went on, we didn’t have enough to break them open. Hignett is likely to make a change or two at the Kassam Stadium. He tried Brad Walker in the deepest midfield role and it did not look to his suiting - the teenager is more comfortable in the opposition half. Nicky Featherstone will resume in the starting XI having turned Pools around in the second half against an Accrington side that had things their own way in the opening 45 minutes. “Nicky made a massive difference,” said Hignett. “As soon as he came on we took control of the ball. “We pushed them back and looked like we going to get something. Hignett had made five changes on Tuesday with Jordan Richards, Walker, Josh Laurent, Jake Gray and Rakish Bingham all starting.